Blog This one's for the youth leaders! Bible questions for kids. This one’s for the youth leaders! Bible questions for kids. Who needs Bible quiz questions and answers? Quizzy Kid created these Bible questions for kids to try and make life a little bit easier for kids ministry teams looking for resources. So whether you have a church camp coming up that you need to organise or if you’re teaching the kids this Sunday hopefully we have something you can use. Our team is always working away at creating more fun quizzes for kids. If you have any suggestions on quiz topics then send us a message. We love hearing your ideas. Of course these Bible questions for kids aren’t just for youth workers, you might be a mom or dad who wants to teach their children about Christianity. Or maybe you want to test out your own biblical knowledge and see how well you do answering the questions! Do you know who first saw Jesus after his resurrection? What is the last word of the Bible? Just how tall was Goliath?!! Now if you’re a Christian family then of course, teaching your kids about the Word of God is serious business. You want to raise your children to understand your faith and what it means to follow Jesus. Acting out Bible narratives with lego or toys. Make prayer a regular, daily habit. Identify a time that works for your family. Maybe bedtime is a natural time to stop and think about your day together. Or perhaps on the way to school you can spend some time chatting and praying. Find the time and rhythm that works for you. Sing hymns and worship songs together. If you have young kids then action songs are engaging and super fun. If you have older kids maybe try listening to worship music as a family and talking about what the lyrics mean. Are your kids arty? Spend time doing a craft activity together – you could draw and decorate animals from Noah’s Ark. We found loads of great Bible craft ideas on the We Have Kids site. And of course, you could try using Quizzy Kid’s Bible trivia to make learning fun! You can complete the free online quizzes or if you want to print them out then you can do that too. I’m not an expert on how to teach the Bible to your children but I think the list above will help your family to have fun at the same time as emphasise the truths of the Bible. 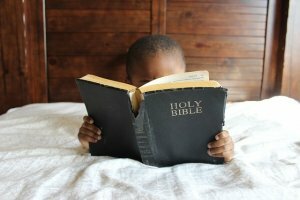 If you want to know more about how to teach the Bible to your kids then The Purposeful Mom has a great article about this. Do have a browse of the quizzes in our Bible section. We hope you’ll find them useful.